If you’re wheat, or gluten sensitive, fast cooking Quinoa offers a delicious alternative. Quinoa, like Buckwheat are known as pseudo grains, meaning they look like grains such as rice and wheat. Pseudo grains behave like true grains because they can be ground into a flour, consumed as a warm breakfast cereal, or prepared as a delectable side dish. Unlike true grains, Quinoa and Buckwheat do not contain gluten. The packaging of Quinoa and Buckwheat is confusing, because they are often referred to as grains, instead of seeds. Quinoa is not a grain. It’s a tiny seed, no bigger than a mustard seed, that belongs to the spinach, swiss chard and beet family. Quinoa seeds cooked in water make a fine, nutty flavored breakfast cereal. The seeds come in red, white, and black, and are high in lysine, amino acids, and iron. Cooked Quinoa has a light and fluffy texture, is very nutritious, and is similar to couscous. The red variety is more nutty and stronger than white Quinoa. When buying Quinoa, the package will most likely be labeled as Quinoa Grains. It’s still a seed, unless there is something else in the box or bag. Read labels thoroughly if you want to avoid gluten. It should read, 100 percent Quinoa, or gluten-free. 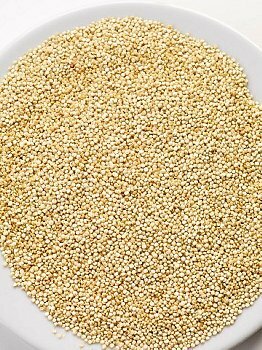 If you can’t find Quinoa seeds locally, follow these links to Amazon where you can buy Quinoa seeds, flour, and other products. 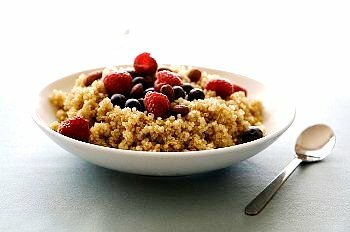 Here’s a link with plenty of creative Quinoa recipes, and nutritional information from the New York Times Recipes For Health: Quinoa. Posted on August 24, 2012, in Food, Recipes, Recommended Products and tagged Amazon, Buckwheat, gluten free cooking, grain alternatives, grain replacement, New York Times, quinoa, wheat alternative. Bookmark the permalink. Leave a comment.